In the long history of the Scottsdale Football Club very few individuals have given their all for the cause quite like Ken ‘Bluey’ Lette. 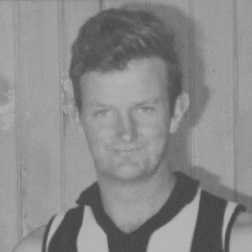 Making his senior debut for Scottsdale as a 19-year-old in 1962, Lette was a member of the Magpies’ maiden NTFA premiership side in 1964 in what would be the first of 11 senior grand final appearances over 14 seasons. A ruckman who could play forward and who regularly got the better of larger opponents despite standing only 6’0, Lette was renowned as an exceptional shot for goal, rarely missing from within 40 yards. Indeed it was arguably in front of goal where Lette was his most influential, with noteworthy efforts including 11 goals in a 116-point win over North Launceston in the final round of 1971, and four goals in the 1970 NTFA premiership win over Launceston. However, his most crucial performance in front of goal came in the legendary 1973 state final against Cooee. With Scottsdale 32 points down at the final change, Lette kicked two of his team’s six final quarter majors, the second of which – his third for the match – put the Magpies in front late in the dying stages. Though an infrequent NTFA representative player, Lette’s performances when he was chosen for the Association were as brilliant as those for his club. The highlight came in 1973 in a match against the NWFU at Latrobe where Lette dominated the ruck against Latrobe and former St. Kilda big man Geoff Cayzer, who had a four-inch height advantage. At the time of his final senior match, the 1977 NTFA grand final against North Launceston, Lette was the games record holder for both Scottsdale and the NTFA – mantles he would hold until premiership teammate Greg Lethborg went past him some years later – and in the year 2000 he was named at full forward in Scottsdale’s ‘Best Team, 1960-2000’. His final career resume reads 315 senior games, 11 grand finals and seven premierships; a fantastic effort, but an achievement made all the more remarkable given the fact that Lette had lost all of the toes on one of his feet after an accident with a bulldozer. As highly skilled a player as he was, Ken Lette’s talent on the field was matched by his popularity off it. An incredibly hard worker for his team and an immensely popular clubman, Lette was praised by 1973 premiership coach Bob Wilson as, “the best team man I ever coached”. Given the calibre of the individuals to have graced the field for Scottsdale during that period, there can surely be no higher accolade; not that he’d ever say so himself, as one of the most humble champions Tasmanian football has produced.